Orange Kiss Hybrid Sweet Pepper | Henry Field's Seed & Nursery Co.
First ever orange Marconi-type pepper! 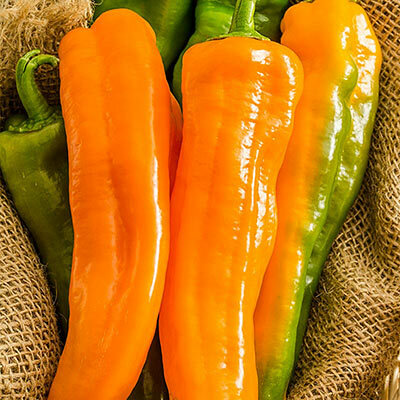 An exciting new development in peppers, Orange Kiss Hybrid Sweet Pepper is the first orange macaroni type with an intense sweet flavor and a juicy, crisp texture! This Italian type pepper will grow up to 8-in. long and is unbeatable for roasting, fresh eating, salads, salsa, grilling and frying. 75 DAYS. Height 3 - 4 feet. Height: 3 - 4 feet. Spacing: 15 - 18 inches. Size: Long Italian-type (bullhorn shape) 8 inch long fruit. Fruit: Green ripening to orange, bullhorn Marconi-type.